Say hello to the new Love Notions Serenity Sweater…there are so many pinterest-y photos of this style floating around…and all the testers felt like Tami oohed and ahhed when she showed us. We feel like Tami hit this out of the park! The perfect layering piece…this sweater is truly perfect year round! I opted for the short sleeve version in a light sweater knit I picked up at Walmart earlier this year…I felt like it would be perfect as fall (so.very) slowly approaches here in the South…and I am totally in love with it! 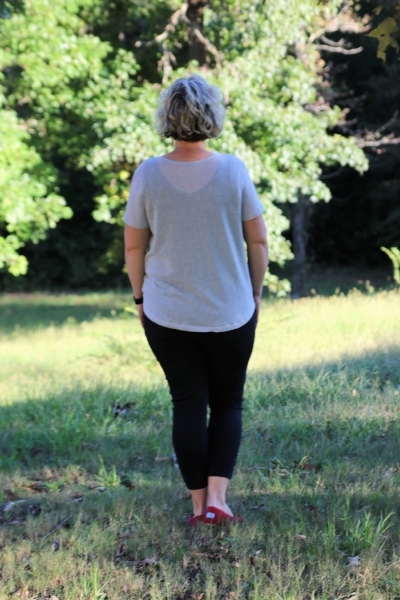 I chose the curved hem back, but there is a straight hem back too…lots of possibility to choose the look that works best for you and your body! The design of the front totally caught me off guard, but is so easy to do, and drapes so nicely on! The Serenity Sweater is a super secret design that Tami did for a sew-along for the upcoming Love Notions retreat - how much fun is that?!? The sweater is on sale for $8 through Sunday the 14th. How about you? Which design options will you sew first?!? To see lots of additional tester versions - click here!